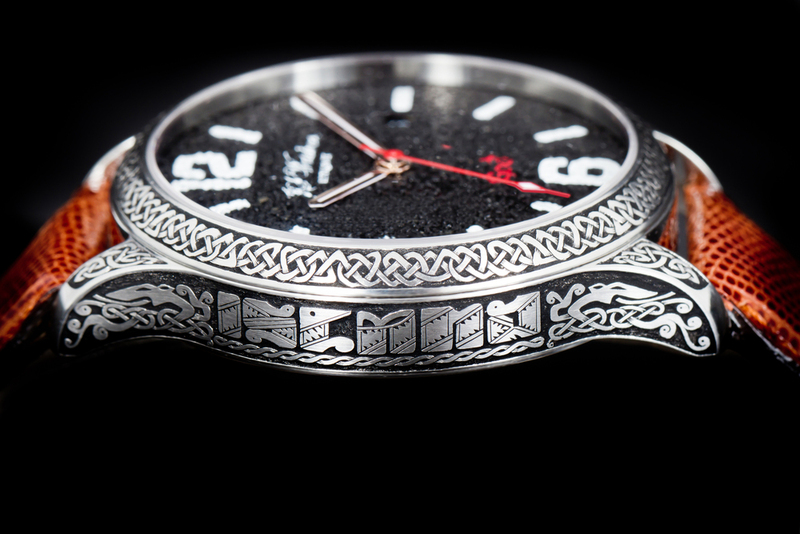 The Frisland Goð Special Edition watch displays a splendid face, made of ash from the volcano Eyjafjallajökull, in a 42 mm diameter steel case with hand-engraved ancient-style motif. On the side of the watch one can see the word ÍSLAND (ICELAND) written in "Höfðaletur", (Head Letters) which is an old Icelandic font which was mainly used to adorn things made of wood, horn and, later on, metals. It has a See-through Sapphire Crystal back. It has a Swiss Made Mechanical movement “Execution Top” with Automatic winding, 25 jewels, Custom decorations, Blue screws and Rhodium plated finish, which can be examined in detail, through its sapphire crystal case back. The decoration is in the highest traditions of craftsmanship. 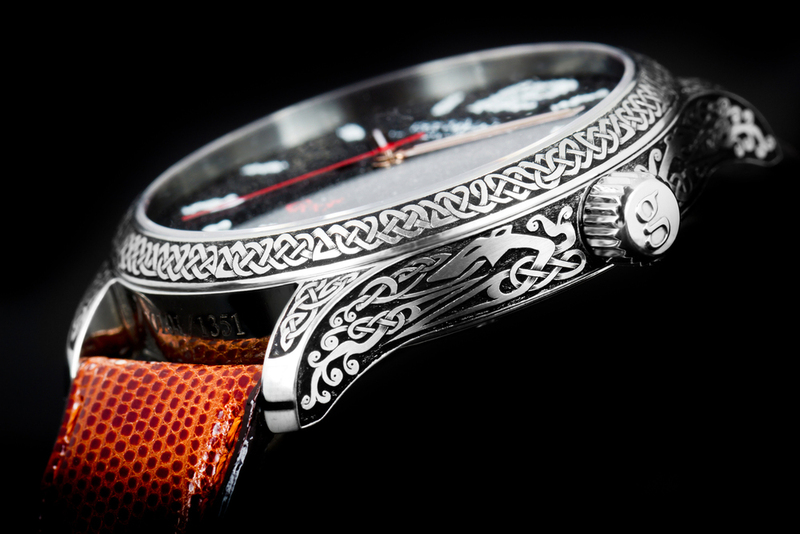 The watch is only available by custom order, it is possible for those interested to have the original "Höfðaletur"-text changed to something personal like the name of the owner for instance. 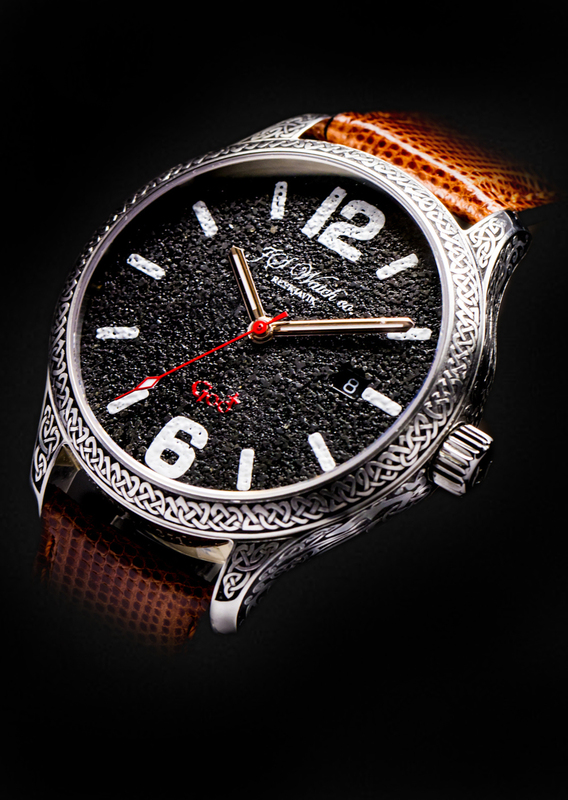 The Frisland Goð Special Edition displays a splendid face, made of ash from the volcano Eyjafjallajökull, in a 42 mm diameter steel case with hand-engraved ancient-style motif. On the side of the watch one can see the word ÍSLAND (ICELAND) written in "Höfðaletur", (Head Letters) which is an old Icelandic font which was mainly used to adorn things made of wood, horn and, later on, metals. It has a See-through Sapphire Crystal back. It has a Swiss Made Mechanical movement “Execution Top” with Automatic winding, 25 jewels, Custom decorations, Blue screws and Rhodium plated finish, which can be examined in detail through a sapphire crystal case back. All decorations and craftsmanship is of the highest quality. Surface finish: Hand Engraved ancient-style motiv. White material on numerals and hour markers. Date display at three o'clock and day display at nine o'clock. 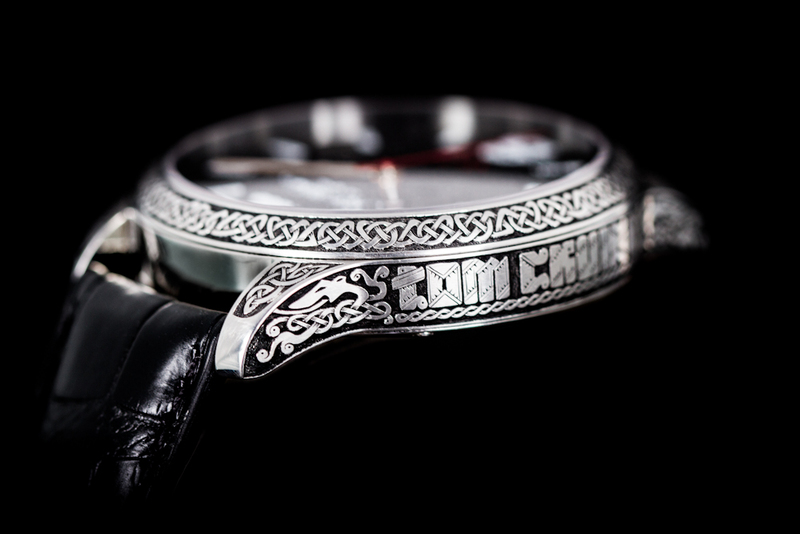 The watch displays a splendid face, made of ash from the Eyjafjallajökull volcanic eruption, in a 42 mm diameter steel case with hand-engraved ancient-style motif. On the side of the watch one can see “Höfðaletur” (Head Letters) which is an unusual Icelandic font mainly used to adorn items made of wood, horn and, later on, metals. “Höfðaletur” brings with it real elegance as well as mystery. In earlier times this type of letters was rather hard to read and for that reason chosen to keep secrets. Items adorned with “Höfðaletur” were those people cherished. 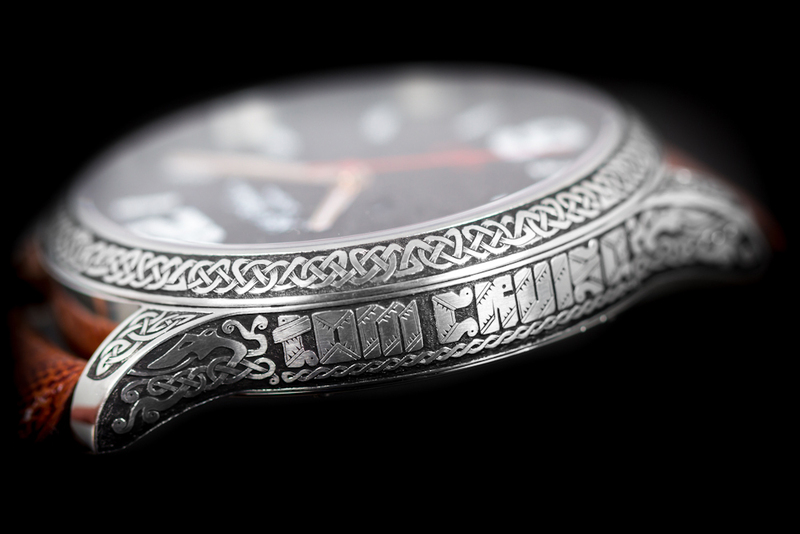 The engraving on the Frisland Goð Special Edition is much inspired by the Urnes style ornamentation which is one if the six commonly recognized styles of the viking era and then the unusual Icelandic font Höfðaletur (head letters) which was mainly used for carving. The oldest known examples of Höfðaletur are thought to be 16th century, and the font is considered to have been modelled on Gothic texture. The letters do not have a fixed form, but the verticals all have a “head” that is decorated with carving, usually simple and sloping but sometimes double. There are many conjectures about the derivation of the name höfðaletur, but no definite evidence exists. 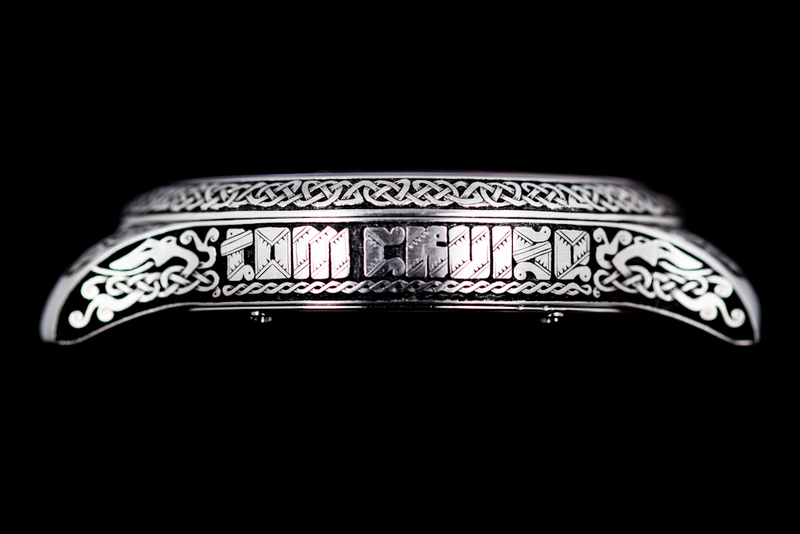 The Urnes-style is the latest of the ornamental styles of the Viking era. Extremely stylized animals are used, with heads and feet reduced to mere elongated terminals. In 2010, the volcano Eyjafjallajokull, turned the whole world upside down by discharging incredible amounts of ash into the sky. The gigantic ash cloud was blown over into mainland Europe stalling airline traffic for days and days. People from all over the world were now affected by Icelandic ash, just as the Vikings had been centuries before. Just as people were beginning to forget and to forgive our small island nation for the eruption and its resulting disruptions, another volcano began erupting. This time it was one of Iceland’s most active volcanoes, Grimsvotn. Even though the airline industry had learned some difficult lessons the year before, this eruption still caused disruption. The minuscule, light volcanic ash that has upended the world twice in two years will give the owner the energy and power that can only be found in the innermost workings of our Earth. Should Icelanders continue practicing their Nordic Pantheism (Asatru), or should they become Christian? That was the difficult issue facing the members of parliament during a session in 1000 A.D. Just as the discussions had reached fever pitch, news of fires and lava headed towards the homestead of Snorri, one of Iceland’s most respected citizen, was reported. The pantheists immediately pointed out that the eruption was obviously happening because the Gods were upset with these proceedings and the discussion of religious conversion. Snorri then questioned, “What angered the Gods when the earth burned where we now stand?” No one could come up with an answer to this question and this led to Iceland’s peaceful conversion to Christianity. This young, active island became a haven for Vikings who left Norway to escape the harsh rule of King Harald Fairhair (Haraldur Harfagri) looking for new places to settle. Just like the Papar before them, they were most likely surprised by the earth’s constant rumblings. When traveling across the mountains, they would have seen barren fields of lava, ash covered hills, and plumes of white smoke from geysers. The contrast of the fire and ice would have perplexed these early settlers who believed that only those who died of old age, sickness, or as a coward were sent to the underworld of “Heljar”, a place covered in snow and ice. The settlers would eventually have been forced to adjust their faith to rationalize the fire, shaking ground, and loss of human lives and livestock . Then there was the ash. The fine, minuscule dust that the volcanoes churned out in massive quantities. The effects fo the falling ash was devastating, leaving dead animals and suffering farmers in its wake. In 2010, the volcano Eyjafjallajokull, turned the whole world upside down by discharging incredible amounts of ash into the sky. The gigantic ash cloud was blown over into mainland Europe stalling airline traffic for days and days. People from all over the world were now affected by Icelandic ash, just as the Vikings had been centuries before. Just as people were beginning to forget and to forgive our small island nation for the eruption and its resulting disruptions, another volcano began erupting. This time it was one of Iceland’s most active volcanoes, Grimsvotn. Even though the airline industry had learned some difficult lessons the year before, this eruption still caused disruption. The minuscule, light volcanic ash that has upended the world twice in two years will give the owner the energy and power that can only be found in the innermost workings of our Earth. The watch displays a splendid face, made of ash from the volcano Eyjafjallajökull, in a 42 mm diameter steel case with hand-engraved ancient-style motif. On the side of the watch one can see the word ÍSLAND (ICELAND) written in "Höfðaletur", but "Höfðaletur" (Head Letters) is an unusual Icelandic font mainly used to adorn things made of wood, horn and, later on, metals. "Höfðaletur" brings with it real elegance as well as mystery. In earlier times this type of letters was rather hard to read and for that reason chosen to keep secrets. Things adorned with "Höfðaletur" were those people cherished.